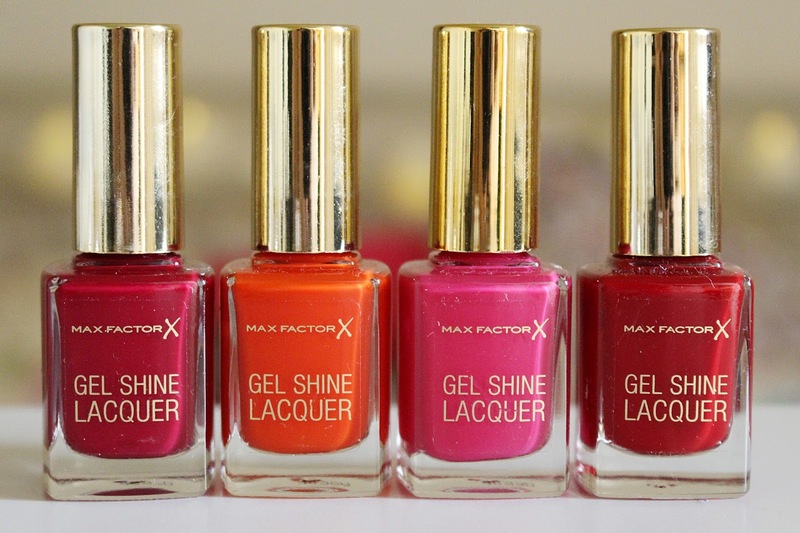 I was pretty excited a little while ago when four shades from the new Gel Shine Lacquer collection from Maxfactor turned up at my doorstep. I'm sorry to say I've never actually tried a polish from Maxfactor before, so I was really keen to see how these new lacquers faired. The new range features nine shades in total, and the four I received were Sparkling Berry* - a deep berry shade, Vivid Vermillion* - a totally 'pow!' bright orange, Twinkling Pink* - the perfect bright pink, and Radiant Ruby* - a gorgeous deep ruby red. Each of the shades are seriously stunning and I love the mix of brighter colours and deeper, more autumnal shades. I can definitely see the two reds getting a lot of use over the coming autumn months. In terms of quality and finish, these polishes are divine. The above nail swatches are actually from just one coat - proving just how opaque and pigmented these polishes are. They glide on seamlessly, dry quickly and give a completely stunning glossy finish. You look like you've had a gel manicure with these babies on, and the staying power is fantastic, with them lasting a good few days before they start to chip. I'm actually happy to say these are better quality than some of the big name nail polish brands out there, and at so £6.99 each they are completely worth the money. Have you tried the new polishes from Maxfactor yet? I've got my eye on this green shade - too perfect for autumn! The polishes are available at Boots and Superdrug stores, and are currently on offer for just £5.99 at Superdrug!